The Flaca Detox™ shake is a proprietary detoxification powder made of a unique and advanced combination of natural, high quality nutrients, antioxidants, fiber, fruit and vegetable extracts, and pure herbs that support and balance the overall detoxification and elimination processes. Take one shake packet twice per day and prepare the shakes using the provided guidelines. Replace two meals with delicious shakes and then enjoy a simple but powerful third meal. Take one capsule-filled packet with each shake, twice a day. 17 g of protein from certified organic, non-GMO North American grown yellow peas. They are a superior and low allergenic protein source with an excellent amino acid profile. Provides a great alternative for people who are sensitive to dairy, or are just trying to decrease or eliminate dairy to minimize inflammation. Free from all ingredients that cause inflammation and trigger allergies. Flaca Detox™ is paleo based and 100% vegetarian. It is gluten-free, dairy-free, lactose-free, and whey-free. It is a non-GMO product and DOES NOT contain sugars or artificial sweeteners, soy, corn, or egg ingredients. Full Multivitamin/mineral included in the shake for detoxification enzyme support and to nourish the body while it is going through the detox. Powerful Nutrients for detoxification support and balance. Specialized Nutrients to promote bile flow and and elimination, and improve gallbladder function. Therapeutic Antioxidants for tissue protection. Glucomannan and fiber to improve satiety, digestion and facilitate elimination. Alkalizing veggie and fruit blend for added antioxidant and metabolic support and nourishment. A pleasant taste and texture easily combined with other ingredients for a variety of shake flavors. Protect the Liver while chemicals and other toxins are mobilized inside the body and prepared for elimination. 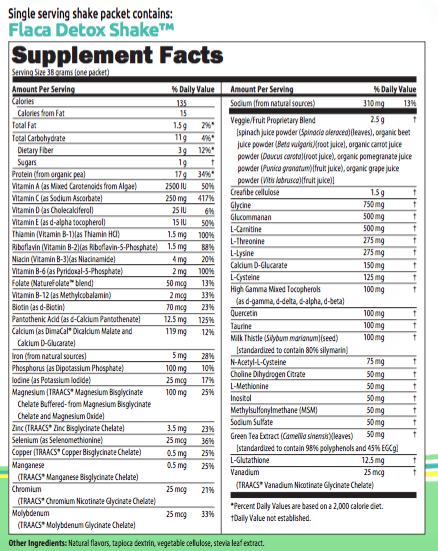 Specific Nutrients that assist in the avoidance of toxic overload. 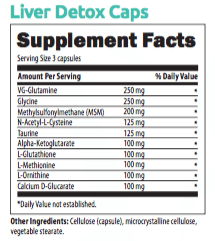 Support Phase II Liver Detoxification so that toxins are safely and effectively eliminated from your body. Effective Nutrients to ensure toxins are not reabsorbed which may harm the body’s cells and organs resulting in negative detox symptoms. Help minimize the discomfort from any possible “detox” symptoms which are common during the first few days of a detox. An effective detoxification requires digestive system focus on the detox process and not on digesting foods. Liquid meals like Flaca Detox™ are ideal in this way as they require less time for digestion, reducing the work for your digestive system and allowing your body to successfully complete the detoxification and elimination of toxins. Given that liquid meals spend less time in the stomach, there is less time for protein absorption and protein is fundamental for successful detoxification. Therefore, it is very important to add nutrients that can ensure adequate protein absorption from liquid meals. 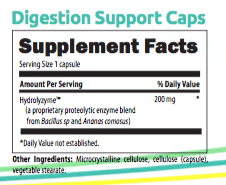 Flaca Detox™ Digestion Support Cap is specially formulated for these purposes. Protein absorption is critical for effective detoxification. Without adequate protein, toxins cannot be fully processed and eliminated from your body. Unique Blend of Enzymes that helps to properly digest and absorb the protein in the shake. Liquid meals like Flaca Detox™ shake, pass through the stomach faster than a solid meal which means less time for digestion and less protein absorption. Flaca Detox™ Digestion Support Cap has shown to digest over 90% of a serving of protein within 30 minutes. The Cap is also ideal for the many people who have less than optimal digestion which produces less than ideal protein absorption. Minimizes Gastrointestinal Discomfort that can be associated with other detoxification programs. An effective digestion will ensure that proteins and meals are digested properly which will reduce bloating and other gastrointestinal problems such as constipation, stomach ache or gas.